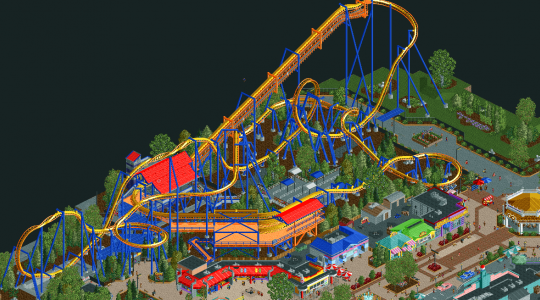 Congratulations to saxman1089's Talon, the latest winner of RCTgo's Build It Competiton! Talon beat the other three entries with 16 votes and 70% of the vote. A recreation of Talon, a B&M inverted coaster at Dorney Park in Allentown, Pennsylvania, USA. I loved our annual trips to this park when I was a kid, and needed to make some part of it as a tribute! Hope you enjoy! For maximum compatibility, please open with OpenRCT2. Congrats on a very well-earned win. Thanks all, glad you enjoyed my entry! Congrats Sax, another wonderful project has been added to our RCT2 repository. This is the first time in about 13 rounds where we've seen a victory from a B&M Invert with this exact color scheme. Hope to see more! My Splash Battle ride got second place. Hey not bad at all! I'm not going to give up on this type of ride. Anyone got suggestions for this ride type for future entries?